Performers include: Mathew Baynton, James Corden, Sarah Solemani, Tom Basden, Dawn French, Paul Cawley, Jordan Long, Alec Utgoff, Emilia Fox, Stephen Campbell Moore, Chandeep Uppal, and Rebecca Front. 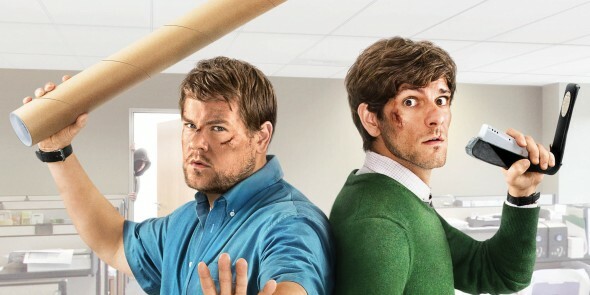 This action-comedy series revolves around Sam Pinkett (Mathew Baynton) and Phil Bourne (James Corden), a pair of lowly Bracknell council co-workers. The duo abruptly become entangled in a far-fetched (but deadly serious) web of crime, conspiracy, and corruption. The story begins as Sam discovers a discarded mobile phone at the scene of a car accident. He answers a call and the voice on the other end (believing Sam is the phone’s owner), tells him that they will kill his kidnapped wife — unless they meet him by 5pm. Terrified, hungover and already very late for work (on top of which his recently ex-girlfriend Lizzie has become his boss), Sam decides to head to the office with the phone before telling the police. He tells his friend Phil what has happened and Phil convinces Sam that they can take care of this dilemma themselves, as an opportunity for the duo to become heroes. They’re soon dragged into a deadly criminal conspiracy. Sam and Phil return to London just before Christmas, only to find themselves up against old adversaries who want them wiped out for good. First released: December 24, 2014. What do you think? Do you like The Wrong Mans TV show? Do you think it should have been cancelled/ended or renewed for a third season? More about: The Wrong Mans, The Wrong Mans: canceled or renewed?